I haven’t written about gardening in quite awhile, since my garden this past summer was not very successful. It started off great and then quickly went downhill. Part was my fault due to neglect and lack of time to properly take care of it and part of it was due to weather and other things out of my control. Anywho in the winter there’s not much action on the gardening front but there are a few things you can do in preparation for next year’s garden. One of them is seed storage. Did you know you can use your seeds for multiple years? Even if you don’t use them all in one year, it doesn’t mean you have to buy all new seeds for the next year. The fact that the seeds say “2010 season” on the package doesn’t mean anything. Seeds will last for several years. With seed storage over the winter there is one main point – keep them dry. As long as you keep them dry they should be good to go for the following year. Store them in a jar or bag away from any moisture. But try as you might, moisture can still seep in unintentionally. 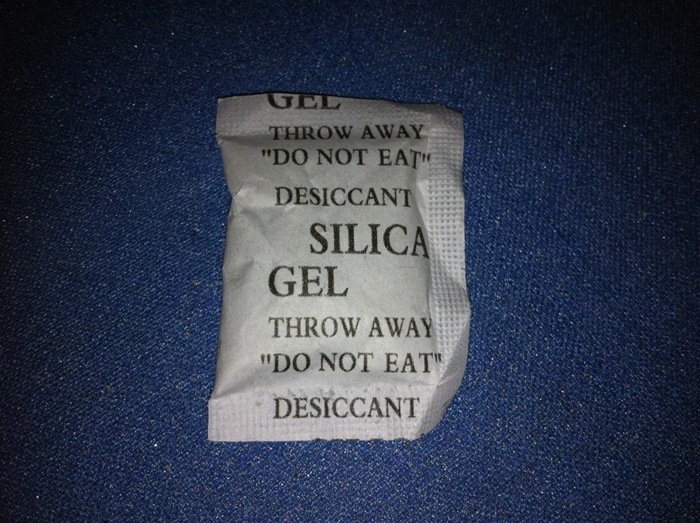 This is a silica gel pack that you get in shoe boxes and bags when you bring them home from the store. They are sometimes found in new coat pockets. These things usually make their way to the trashcan quickly, but did you ever think they might have another use? Silica gel packs are included in new items to keep moisture out, mold out and to keep products dry. Which means we can employ that functionality when protecting our seeds over the winter. Simply save these silica packs when you find them and then put them in the bag, box or jar with your seeds over the winter. Now remember this will not keep critters out, so you’ll need to take other measures to protect your seeds from living things. If you store seeds in an outside shed or building make sure they are tightly sealed in a solid container, not just a bag or a box that a critter could chew through. Remember when a critter got to all my squash seeds earlier this season? I was NOT very happy! ha that’s an awesome tip about the silica gel. I never would have thought of that! I love doing soil prep in the fall because it’s not as frustrating as in the summer or spring when weeds are just DYING to pop up everywhere.